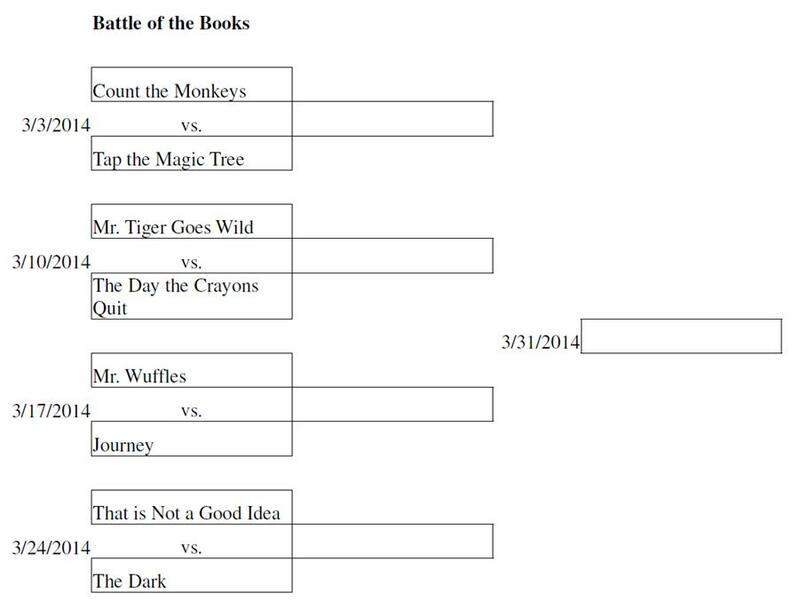 March Madness: Battle of the Books! Mondays in March will be madness at my library! I am planning my first Battle of the Books program. It will run for five Mondays for K-6th graders. I have chosen my favorite picture books of the year and paired them up against each other by similarity of story/illustration/technique. We will brainstorm on what makes a great book and come up with our own criteria. I will read both books aloud. I will have multiple copies of each book and have the children work in teams to review each story on their own. At the end of the program I will ask for a show of hands to vote for the best one. We will discuss the reasons why one book was chosen over another. I will read all four books aloud. At the end of the program I will ask for a show of hands to vote for the best book of the year. For more school aged programs, check out Thrive Thursday. Watch for the new roundup the first Thursday of each month! This entry was posted on January 29, 2014 by mrsshaia in After School Library Programs, Thrive Thursday and tagged After School Library Programs, Thrive Thursday.